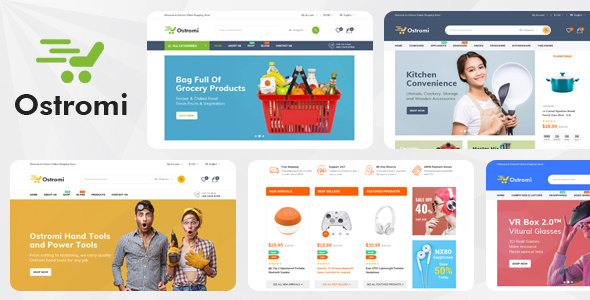 Ostromi – multipurpose eCommerce Bootstrap 4 Template is an elegantly designed HTML template, crafted with the concept of modern eCommerce business mechanism. This template comes with 6 Home Variation, 7 Shop Pages, 9 Product Details Page and 11 Blog Pages. Ostromi is powered with Bootstrap 4, Sass, 2000+ Icon Font, W3C Validate Markup etc. In addition, your visitors will get a fully Responsive layout, Ajax Contact Form and multiple Browser Compatibility. Ostromi has Google Font, Free Updates, Speed Optimization, Dynamic Mailchimp Subscribe Form, Well Documentation etc. On top, the product arrangement and display is extremely user friendly and catchy to look at. Websites made with this template will surely build a perfect bridge between you and your clients. A thing more, that you need now is the best quality product. Every other think you need have been prepared in Ostromi. Hope, our template will help you crack the competition in the eCommerce arena.